Adjustable propane pressure regulator up to 10 psi. For our H205 & H250 burners. 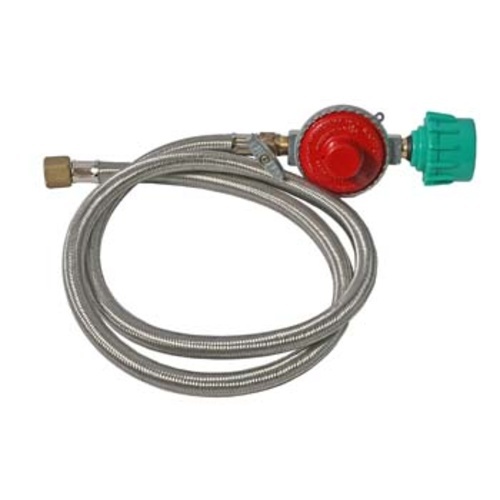 This propane regulator will attach a standard BBQ style propane tank to a brewing burner. These item is not intended for indoor use. This is a great cost effect gas regulator, I have built a couple of homebrew setups and have used this regulator on all of them. There is a needle valve on the assembly but the regulator it self is not adjustable pressure. If you have a campfire of like burner and need a regulator, look no further. This one makes it easy to control the flame and provides plenty of juice.